I’m totally enchanted with pudgy pies (aka sandwiches cooked in a pie iron)! Much like cooking in a dutch oven – they have a very distinct flavor that can only come from being cooked outdoors and in cast iron. 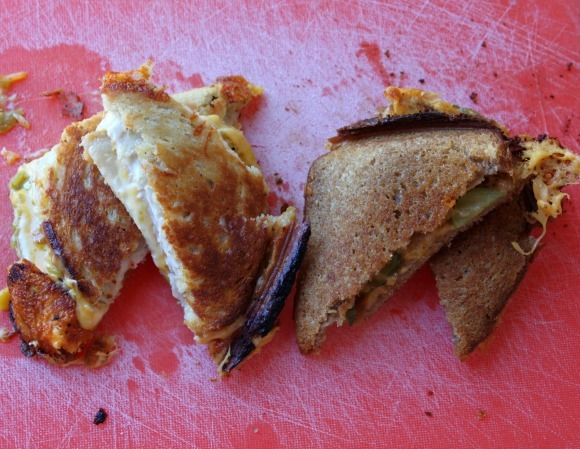 I just got my first set of brand new (unseasoned) pie irons so the best place to start breaking them in was obvious – campfire grilled cheese. 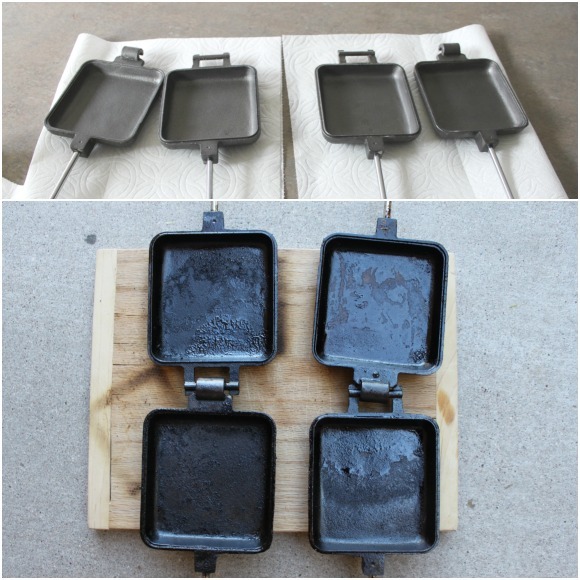 Since these pie irons were the first piece of cast iron cookware that I’ve ever purchased that didn’t come preseasoned I had a little work to do to get started. After watching a few videos and reading some helpful advice from chefs who love cast iron I was ready to season my pie irons. They didn’t turn out looking quite as beautiful as some of the examples I saw online, but they did wash up easily so I’ll call it a success. 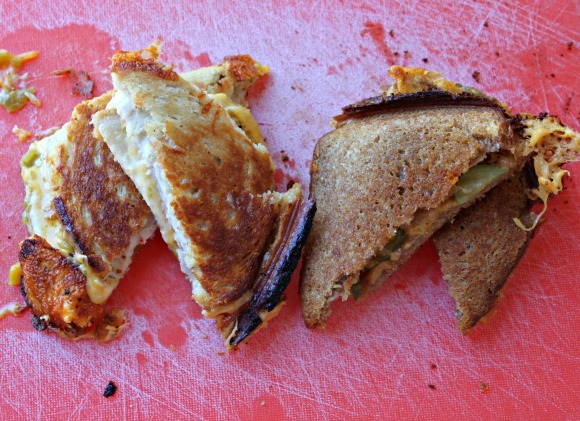 Grilled cheese can be as simple as butter, bread, and cheese. Or you can make it as complicated as you like. 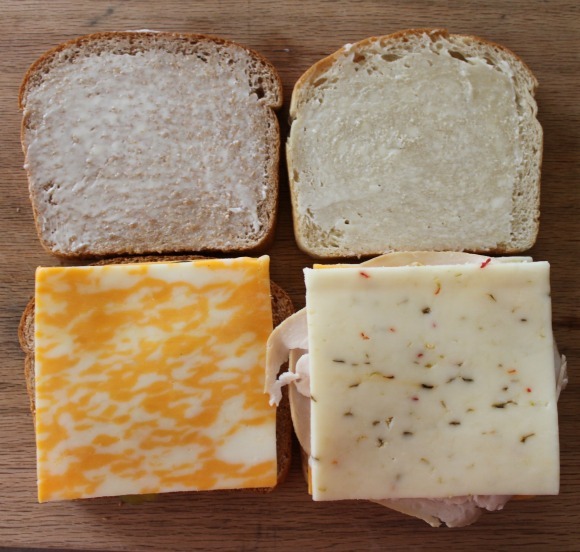 For the sandwiches pictured above – I went somewhere in the middle. But I listed some of the delicious ideas I came up with below. 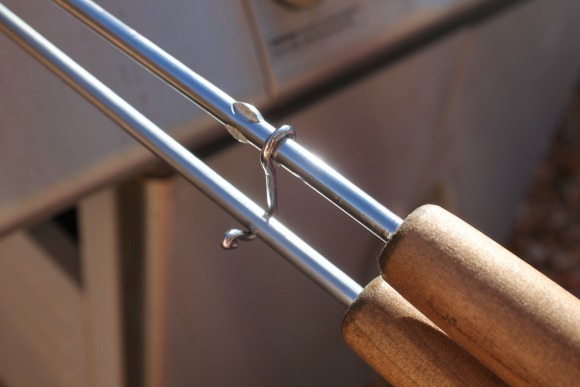 If you plan to take your irons camping with you – make sure you get them all seasoned and ready to go before your trip. This would be a pain in the bum to do at a campsite. 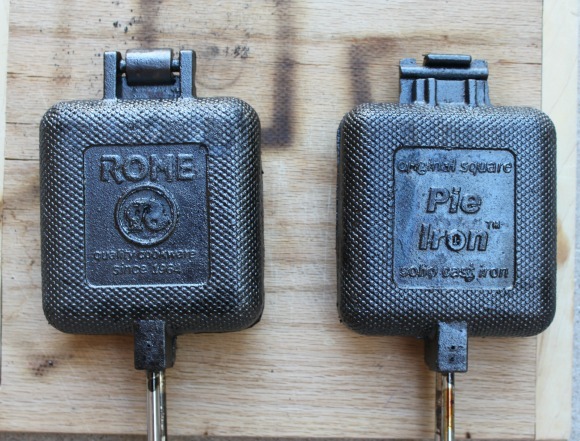 The first thing to do in the case of my new pie irons was wash them with hot soap and water to remove the thin paraffin wax coasting that they came coated with to prevent rusting during shipment. 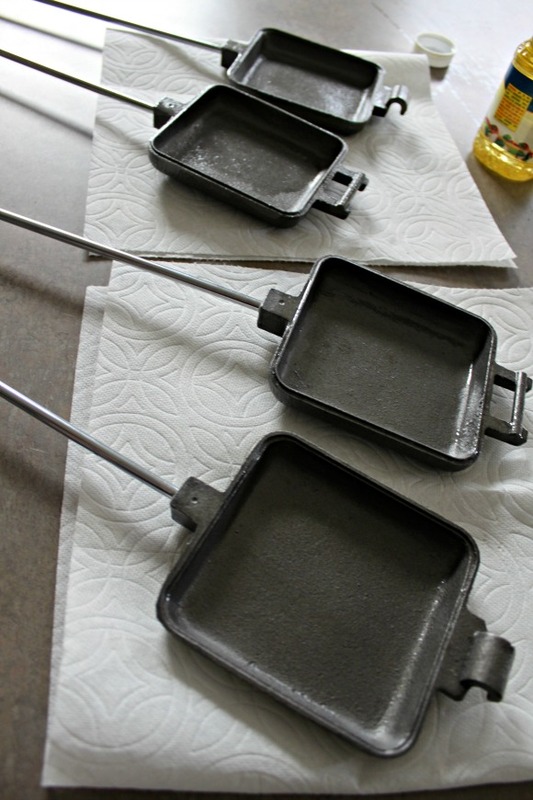 Once your pie irons are properly seasoned – you’ll never use soap again. The wax came off fairly easily, but I did find that the grooves on the back of the irons were a great little hiding place for extra wax. 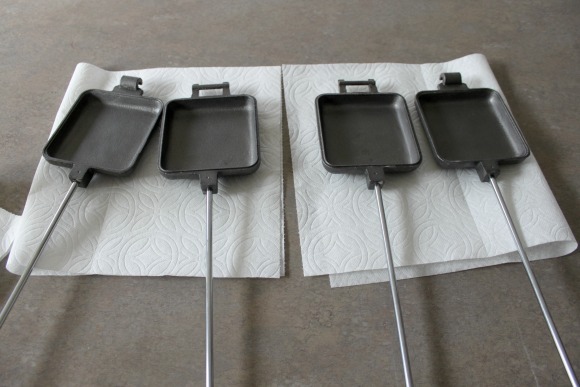 The trick to seasoning your cast iron is to coat it with vegetable oil or vegetable shortening and then heat it. Then you repeat the process a few more times until your cast iron turns a lovely shiny black (it starts out very silver). The first go-round of heating I used vegetable oil since it was what I had in the house already. Here are the irons all oiled up and ready for heating. I opted to use my backyard propane grill to speed things up. 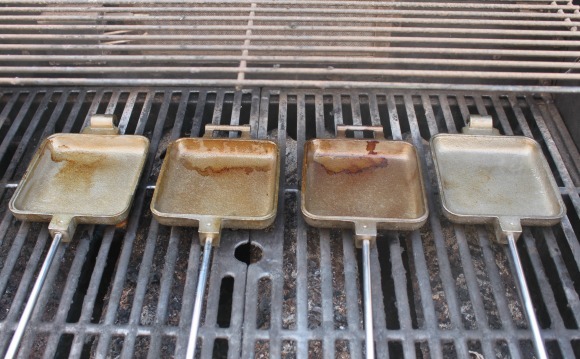 I turned the heat up to about a medium setting, set the greased irons on the grill, closed the lid, and let them heat for 15 minutes. Here’s a shot of them from the back after heating. And here’s the front. The vegetable oil didn’t create a very even finish (or I applied it badly – not sure which.) The next two coats I ended up going with vegetable shortening since it just seemed to stay put better than liquid oil. After 3 rounds of oiling and heating, the irons finally have a lovely black finish. The inside finish still isn’t super smooth (it probably needs one additional coat of seasoning), but here’s a shot of the before and after so you can see the color difference. 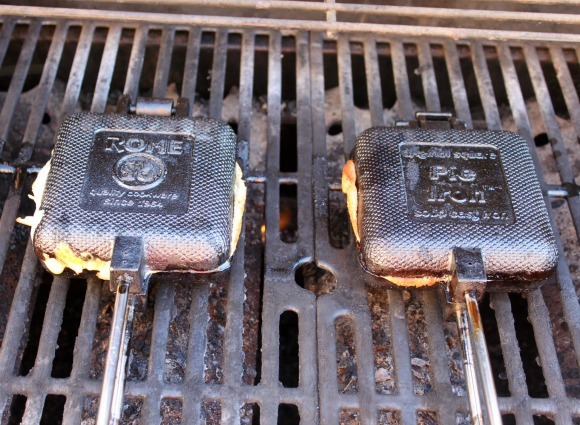 Even though the interior finish isn’t very smooth – it still cooked my pudgy pies like a boss. 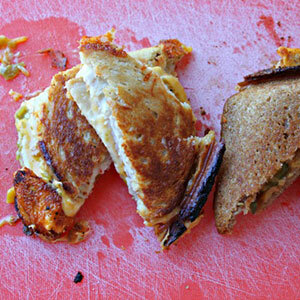 Since grilled cheese has very little prep work, about the only step required at home is to gather your ingredients. 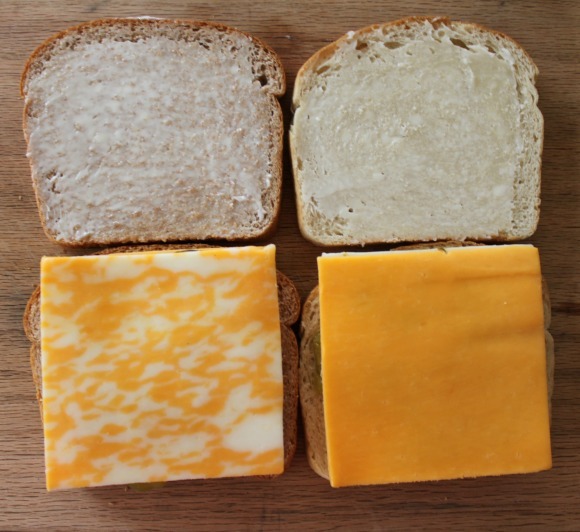 If you didn’t buy sliced cheese, slice it. If you didn’t buy sliced veggies, slice them. Other than that – just make sure you have all of your ingredients ready to rock. Get those coals or logs burning so that you have a nice set of white charcoal briquettes or red hot coals to cook your sandwiches on. 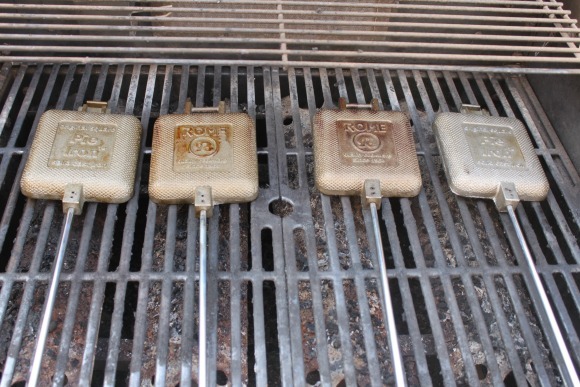 These work great over propane grills as well. Now for the fun part! 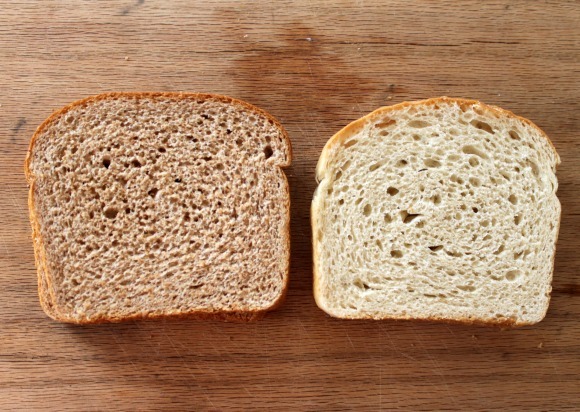 Start with 2 slices of bread for each sandwich. Add your initial layer of cheese. 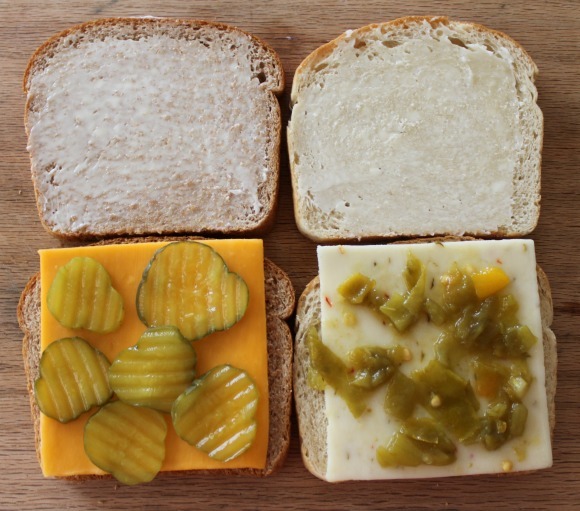 Add your second ingredient (in this case pickles and green chiles.) I found that the cheese needs to be the last layer on the outside of the other ingredients. 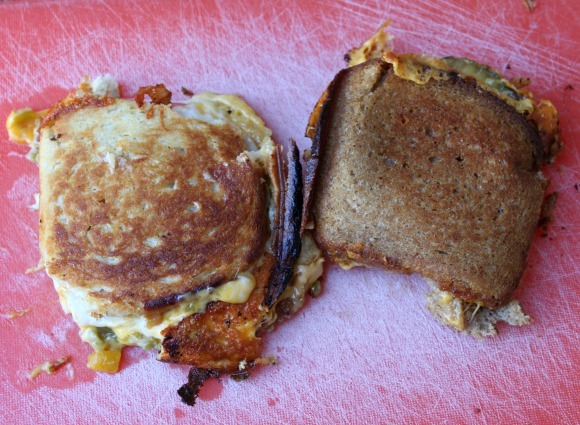 And it works best if you layer other ingredients between the cheese layers so everything sticks together really well. 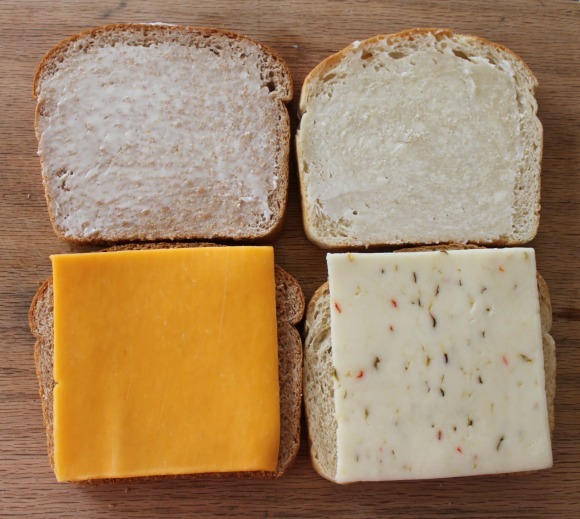 Make sure cheese is your final layer on each sandwich. And finish them off…now we’re ready to cook! 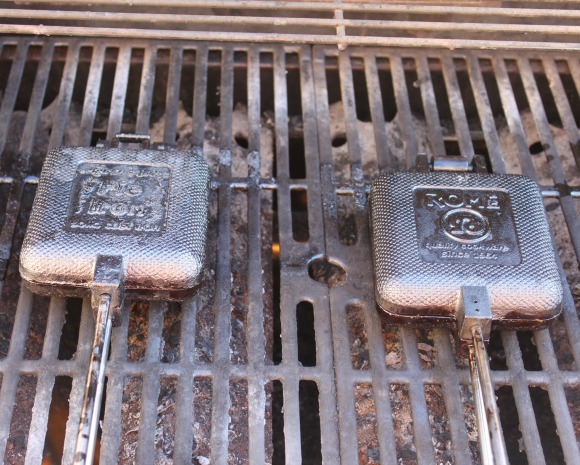 First thing you need to do is heat up your irons over grill, charcoal, or coals. 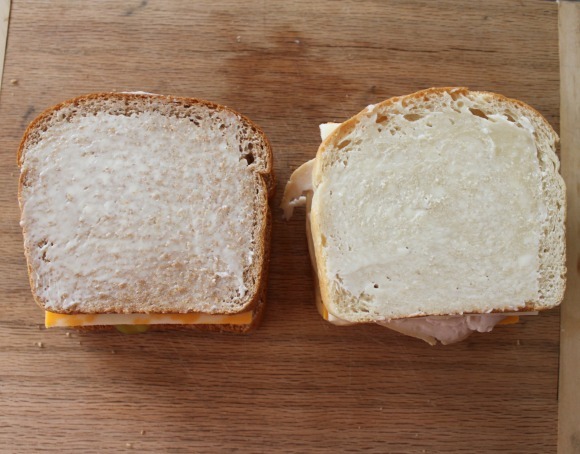 You’ll want them nice and hot so your sandwich will cook evenly on both sides. 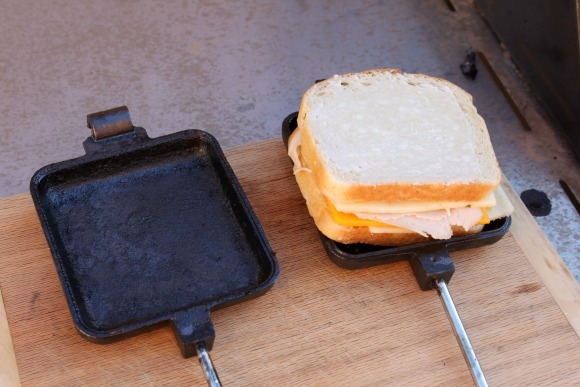 Now carefully place your assembled sandwich in the pie iron (please be careful because it’ll be hot.) Lessons learned for me are that smaller bread and cheese slices work better and ooze out of the pie iron less. 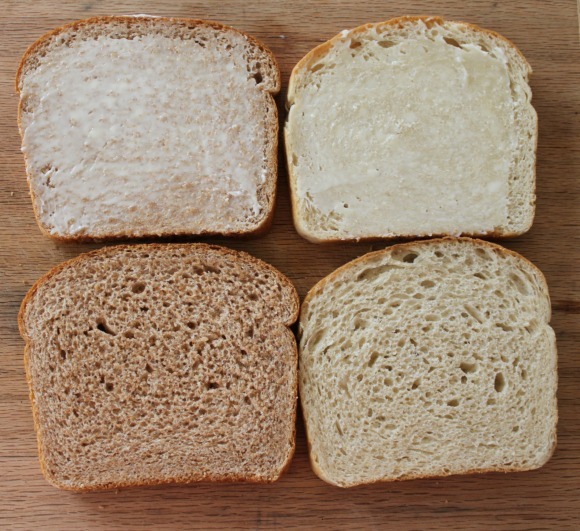 And if any of the bread or cheese does squeeze outside the iron – cut it off carefully before you put it back on the grill. It’ll save you a messy pie iron. Secure the clip on the upper handle of your iron to make sure that the sandwich is getting pressed together during cooking. Cook for about 5-10 minutes (it’s easy to check for doneness by unclipping the handle, taking a peek, and then reclipping it if it’s not quite ready yet.) You’re looking for melted cheese and a nice golden brown bread. When they’re done – carefully remove them from the fire and plop them onto your plate. See how I had a little too much cheese overhang? It was delicious, but made the two sides of my pie iron stick together rather badly. I nearly lost my sandwich to the ground getting it out of the pie iron. 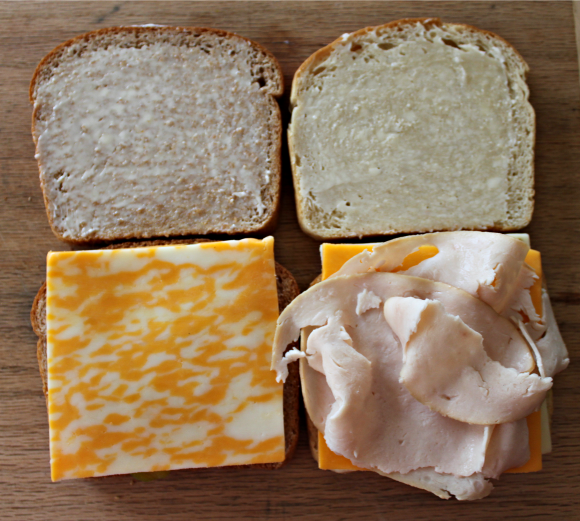 These sandwiches are so dang delicious! I can’t really describe it, but they tasted almost smoky. 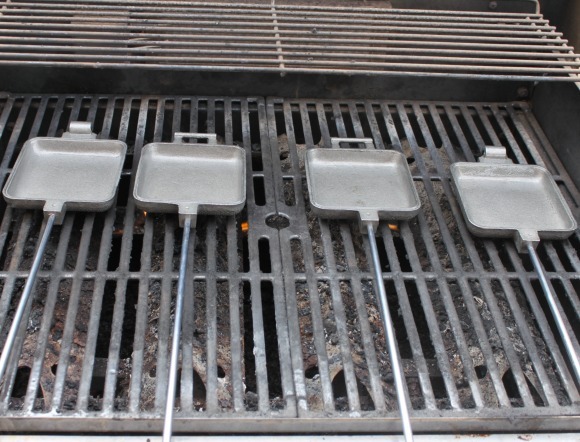 These irons are great for use over the backyard fire pit too. My kids love it when I cook dinner out back!